PLL has been moved to its summer home on the northwest finger of Laguna Negra. Meanwhile, back on the south shore, Jeff Moersch, an assistant professor of Earth and planetary sciences at the University of Tennessee, and his graduate student, Robert Jacobsen, arrived at PLL Base Camp today and began work characterizing the geology of the Laguna Negra basin. Jeff and Robert are conducting two sets of experiments. One is ground-truthing, or verifying, mineralogical data collected by orbiting satellites. The Andes are among the most geologically active regions on Earth. The landscape is continually pushed upward and twisted by the pressure of tectonic plates, and volcanoes explode frequently, sometimes with catastrophic results. These processes, as well as rain and snow wearing away rock and turning it to sediment, have heavily reworked the terrain. A number of orbiting satellites have crisscrossed the Earth, recording infrared spectra that can reveal what types of rocks are present in which locations. Different types of minerals absorb infrared light at different combinations of frequencies, and it is these absorption patterns that orbiting satellites record. Satellites in orbit, however, have to do their observing through the Earth’s atmosphere, which can distort their results. Jeff and Robert brought with them a portable infrared spectrometer, an instrument that does the same thing as the spectrometers onboard a satellite, but that can be carried in a backpack. 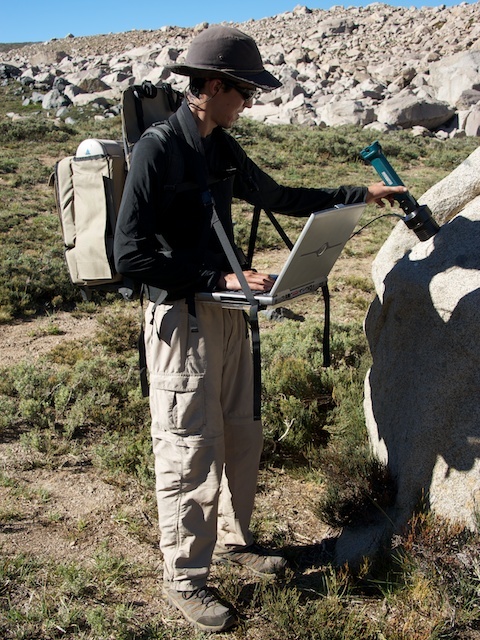 By walking up to various types of rocks and recording infrared spectra up-close, without the interference of the atmosphere, they can obtain what is known as “ground-truth” data. Taking these ground measurements in a few locations will enable them to calculate the distortions caused by the atmosphere and to subtract the atmospheric effect from spectral maps of the entire region to get a more accurate picture of precisely what types of mineral combinations are present. That, in turn, will provide background information for other PLL team members interested in understanding precisely what types of minerals are being washed down from the mountains that surround Laguna Negra into the lake, and by extension, what types of nutrients are – and are not – available to the organisms that live in the lake. Their second experiment involves a thermal camera. This, too, sees in the infrared, but rather than looking at spectral data at small points on individual rocks, the thermal camera takes a picture of the heat being radiated by large areas of the landscape. 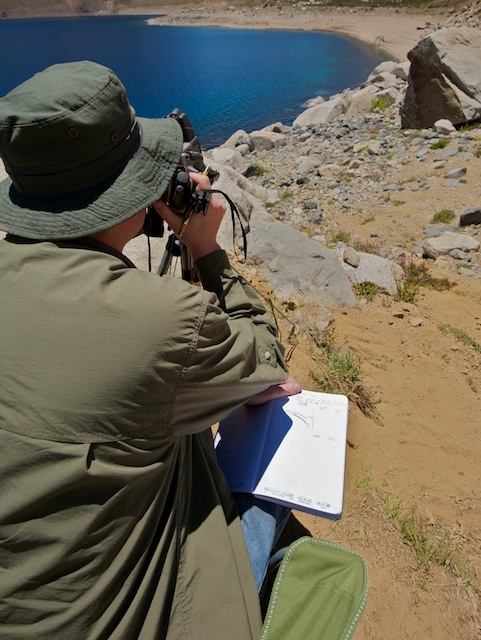 Jeff and Robert set the camera up at PLL Base Camp, pointed toward a distant shore of the lake and portions of the surrounding mountains, and plan to record a series of images over a period of a few days. What they’re interested in is not so much any one individual image, but rather how the “heat map” recorded by their imager changes during the course of the day. The entire landscape heats up during the day, under intense sun that sends us all running for sunscreen (and bemoaning the lack of shade). But different materials retain or lose their heat in very different ways during the cold nights. Large boulders, for example, retain more heat than small grains of sand. Similarly, wet ground retains more heat than drier terrain. The thermal imager thus can create maps that show how materials of different sizes have been sorted, or separated out, by glacial action and by the movement of water on the surface. That information, in turn, can provide an understanding of how water and ice have moved through the landscape in the past, and how it is behaving today. 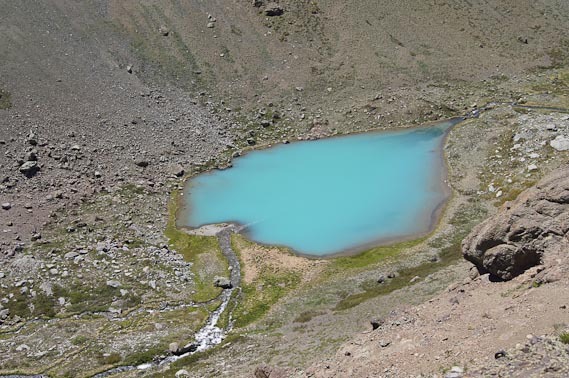 The geologic information from these two experiments will provide a foundation for understanding how the Laguna Negra basin’s ecosystem is evolving in the present period of rapid deglaciation. It may also help planetary scientists interpret images of the geologic remains of past periods of deglaciation on Mars.